Before I left for the Garden Walk, I knew I needed to check on my bees. Thursday was a cool morning… perfect! I was going to check my Golden Hive, as last time, Mesopotamia had the check up. Slow and steady, I pried each bar from the other, still amazed at the efficiency of propolis for sealing cracks! For some reason, they had not expanded the last few bars that I had given them weeks ago. That was out of character, as each time I had previously expanded their hive, they’d started in on building new comb right away. Clear up on bar five… I found this. See those peanut looking large cells? Those are queen cells. At least I thought they were. Now had the queens emerged already? Or were they just building them? This was NOT GOOD. It meant that my queen either was getting ready to swarm, or she wasn’t up to snuff, and they were looking for a replacement. There was plenty of larvae around, so she had been working great. I continued checking my hive, and on the next bar hung four queen cells. They were closed. They hadn’t hatched. I believed my hive was going to swarm. I finished my examination, knowing I had to do something. Insecure about my knowledge, I put the hive back together. I needed to go research my next step. I decided to peek at Mesopotamia while I was there. My Golden Hive bees are so calm compared to my cranky Mesopotamia bees… I get confident, then Mesopotamia brings me back to reality. Sure enough, I cracked open the first bar and bam! BEES ATTACK. This time I didn’t let it bother me. Two bars in, and they’d cross combed… stinkers. I slid my hive tool down in and slowly released it from the sides. It didn’t feel right. 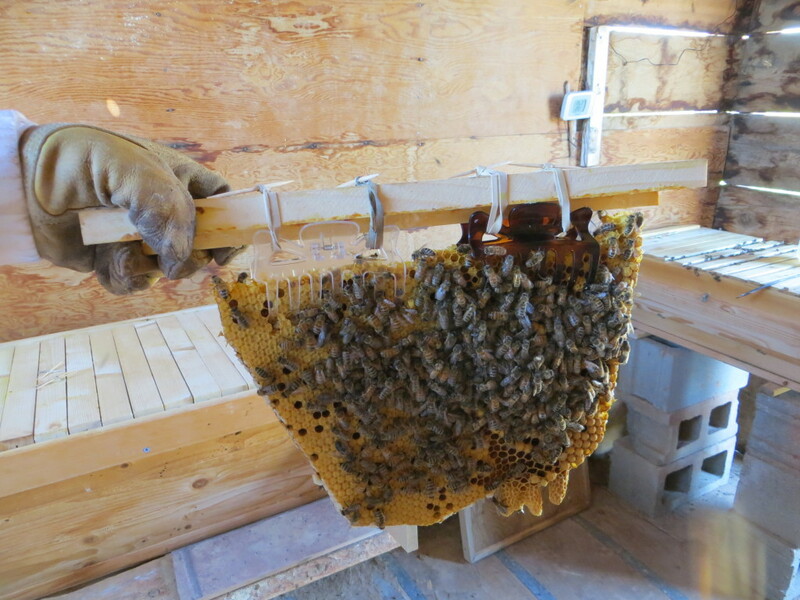 I lifted the bar and *&^^%$#, the comb lay at the bottom of the hive. They weren’t happy with me. 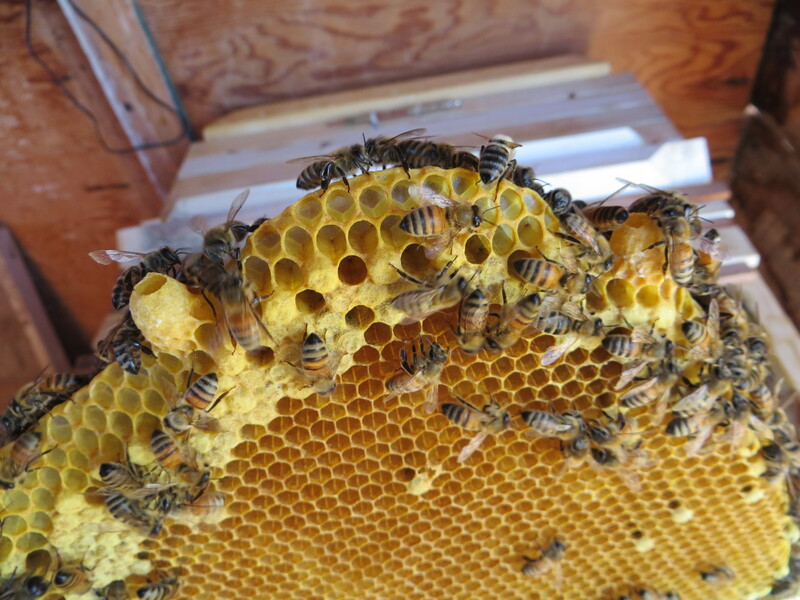 “Well, if you’d build a straight comb, we wouldn’t have this problem!” Does it seem strange I talk to my bees? I lifted the comb up and out and shoved the bars back together. OK, I was going to go look up my next move on the internet. I didn’t return until after lunch, and it had warmed up. Holy Toledo! There were a zillion bees from Mesopotamia flying. I don’t know why… hoping I hadn’t caused a problem with the broken comb… but I carried on with my plan for the queen cells. My best guess is that I hadn’t given the Golden Hive enough room fast enough, and they were ready to swarm. If it had been a supersedure, the queen cells would have been on the face of the combs, not the bottom. 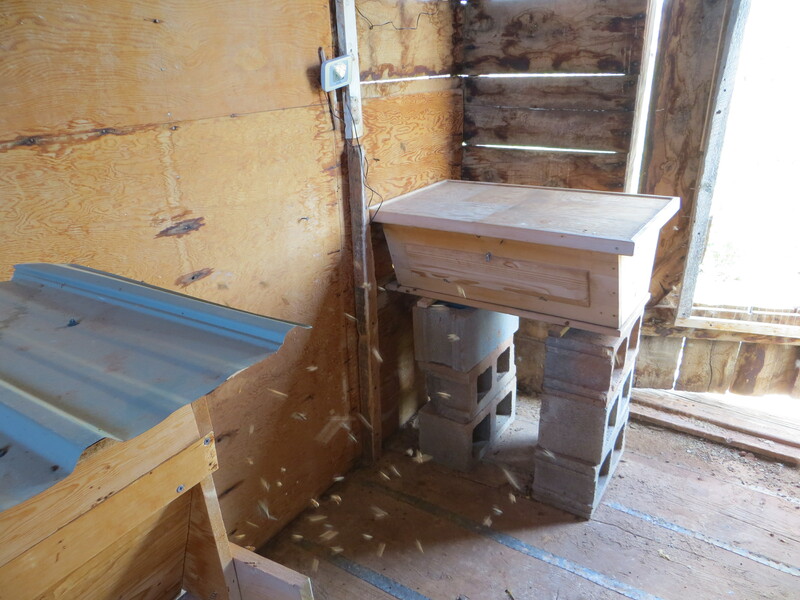 I was going to try for a split… meaning I was going to create a new hive before they swarmed. Unfortunately, my Golden bars don’t fit in Mesopotamia, so I had to remove the comb from one bar and reattach it on a Mesopotamia bar. See the four queen cells on the bottom? This was more of a struggle as well, the sides of Mesopotamia are steeper and narrower than Golden and I had to shave off the sides of the comb so it would fit. I DON’T KNOW WHAT THE HELL I’M DOING, AND THIS WAS THE BEST I COULD FIGURE OUT! I’m sure some bee guys are reading this, just shaking their heads and sighing, but I didn’t know what else to do! Half of Mesopotamia is unused, so this bar now hangs in that side, and I shook some bees off of other combs to build up their workers. If a queen emerges and starts laying, I will have produced another hive and a successful split. If no one’s at home, well, it was the best I could do. After hours of watching, debating, and working, I had to be content and hope that I have three hives and not zero. THAT RANKS AS ONE OF THE MOST STUPID COMMENTS I’VE MADE IN MY ENTIRE LIFE. There was pollen flying around, all on the backs and legs of the thousands of bees. One of the benefits of the honey I hope to get someday, is to build up my immunity against my allergies… but spending hours in the Bee Barn may not be what I want to do in the future! I’ll be brave and return and let you know if I have any bees left. My! This has been a learning adventure! No it is definitely NOT strange that you talk to your bees! I would too if I had any… I have probably talked to wild bees for that matter! lol! I’m reading a book where the beekeeper always whistled the same tune to his bees… so I’m not the only crazy one! Lovin’ your blog and learning a little about bees too. Thank you!!! What a process,! Will that wonderful comb honey on toast in the winter be worth it all? Very interesting! This is really fascinating. I have never seen close up pictures of bee hives before. If nothing else, the rest of us are getting an education also. And an appreciation of how our honey is made. I had no idea keeping bees was so involved. Even more respect for the beekeeper I buy my honey from. Love the photos of the queen cells. Again, I had no idea. WOW!!! I would never have connected allergies with bees. Hope your feeling better. The pictures of your Mom’s memorial walk just came through. What a wonderful tribute. I know… I feel silly I didn’t think of it that way until Vernon pointed it out. Hope summer is treating you well!